#FeatureFRIYAY November: filter overview, more white-labeling options and more! Filtering is a great feature to drill down on what you want to show. 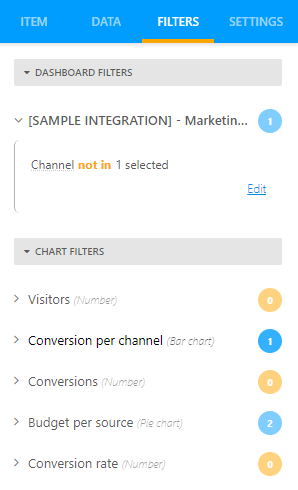 So, we start adding filters to our dashboard, but 1 filter quickly becomes 10 filters… In the end, you’re not sure which filters you have enabled on your dashboard, or on a specific element. So, we made that easier for you! We added a filter overview, where you can view and manage all of your filters at one glance. In the overview, you can directly add or delete filters, or adapt the filters that you’ve currently set. So, if you want to find or adapt a filter fast, no need to start searching and clicking around in your dashboard! How to do so? To customize the email message, simply go to the dashboard you want to send in a scheduled export. 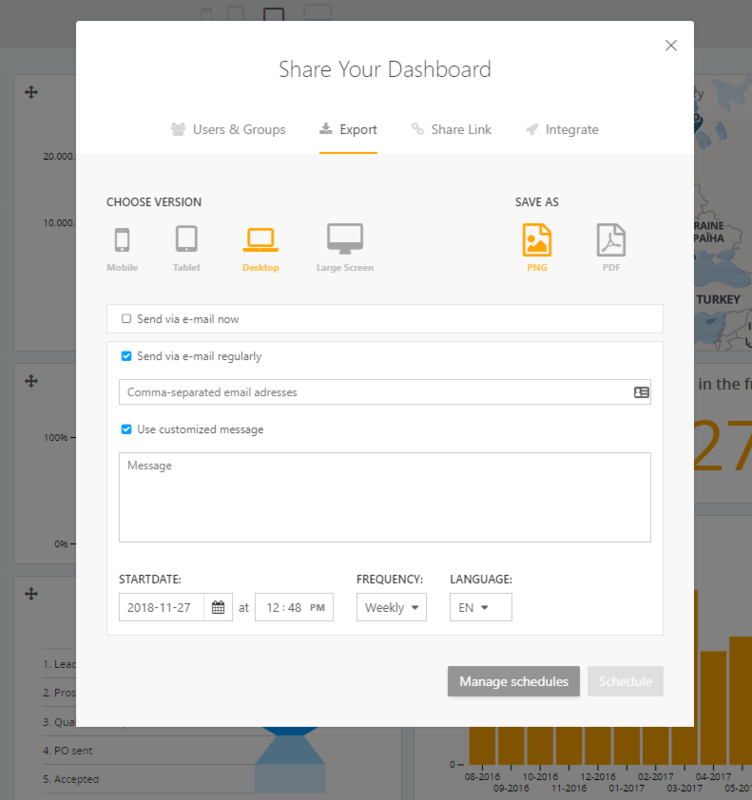 In the share modal, click on the export tab and customize your message there. To change the email sender, go to your Organization in the upper right corner, and click on the white-labeling tab. You’ll find a new section where you can easily change this. The result? Check out an example email below! Do you often use local files like Excel or CSV as a data source? Then you’ve probably used our “reupload” feature. It lets you update your existing Cumul.io dataset with the latest version of your local file. We’ve brought some changes to the interface for reupload. With these new improvements, it’s super-clear when your upload is completed. Simply drag, drop, and wait for the “completed” message while we’re processing your upload! Haven’t used our reupload feature yet? Simply go to ‘Datasets’, upload a CSV file, and navigate to the ‘detail’ section of your new dataset. There, you’ll find the reupload modal waiting for you to test it out! Note: when reuploading, you can either replace the dataset, or append rows to it. So, don’t forget to tick or untick the ‘replace’ box as you see fit. Next to adding new charts, we strive to keep giving new love to our existing visualizations. This month, we added some improvements to the alluvial chart and the slicer. Alluvial charts can get quite complex. When you add more categories, your flow diffuses. Especially if you want to view the full flow of 1 specific element, some interactivity is really handy. As a solution, we added interactive hovering. It allows you to drill down on the distribution of 1 specific element, by simply hovering over the node you want to investigate. In addition, you can show the values of the nodes by default, or show the link values upon hovering. Simply activate this in your item settings. For example, have a look at the chart above. It visualizes the deaths of the Titanic. Hovering over ‘female’ will show you in 1 glance that almost all of the female deaths occurred in 3rd class, a limited number in 2nd class, and NONE in 1st class. As you see, hovering has opened up some new insights! When enabling the values and hovering over ‘male’, you’ll see the exact amounts within the flow: out of 79 male passengers, 70 did not survive, of which 38 were travelling in 3rd class. That’s more than half! Our filters got even more exciting! Just like the search & select box, the slicer filter now also supports multiple data formats. Next to hierarchies, you can now add date fields or numeric fields to the slicer. Wow, big thanks to Saint Nicholas! Start exploring these features in the app today. Feedback or suggestions? Let us know in the comments. Empower your business with insights from ALL your data sources! Learn with us during the Academy Week!